SPADE, the design magazine completed this year, four issues that discuss design through a series of constructed lenses. For the fifth issue, and hopefully for many initiatives leading from it, it plans to turn the spotlight on us, and what we do- on architects and the profession in India. As a percusor to this an Architects Retreat is being scheduled in Mumbai on 22nd Feb 2014. The first poster announcing it, is here below. To kick off the process we had written a mail that we tried and sent to as large a body of architects as possible in the country and also followed this up with many many phone calls. The response has been extremely positive and sincere. The process is well on the way. Do see the mail below. We do hope this mail finds you in good spirits. 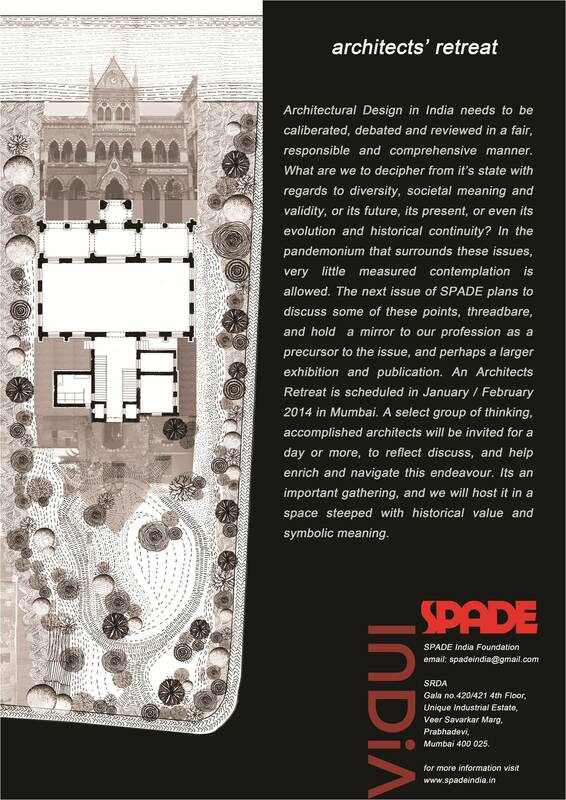 We are writing to you after a long time, to talk a bit about Spade, 12 on 12, Architecture in India, and such things and really would solicit your opinion and feedback. It’s really important for us to hear from you and tell us what you think. Without that, this won’t make too much sense. About 7 years back all of us helped make 12 on 12, the forum. It was an egalitarian, non-hierarchical forum that allowed architects to come together and just talk. Post that, there are many lovely forums set by us that in some sense or the other kept the spirit alive. SPADE started with the commitment of doing 4 volumes – each one on a theme that was abstract and through it allowed many explorations about our world of design and physical space. The themes were architecture and politics, re-incarnation, collage, and opium and through them, we all hoped, thought better, thought a bit more, thought about things we would normally not think about. Its been a good journey. And we are hoping to revive some of its energy and goodwill, and address one theme that we think is the most abstract of them all – The state of design in India . This animal has been discussed, reported, assailed, celebrated in all kind of ways and will continue to do so and it seems to us that rather than making it legible, it gets more and more buried in skins that are superfluous, have half truths, are self serving, and at times just plain funny. The many events that are organised around it, the awards that seem to creep out of the woodwork, the many self professed Gods and Gurus, only seem to obfuscate, what is it that we do, dream, and design. Like the proverbial tale of feeling up the elephant ( such a vulgar thing to do anyways) and imagining that the parts will make the full, in India , we believe we are feeling up different animals and hoping that they will become one legible one. The debate even in the best of the times is complex and made more so by all the smoke around it. So, at SPADE we would like to investigate this. Why us? We are all well poised to do it, we don’t have any commercial compulsions, we have no advertisers to keep happy, we don’t belong to any group, we have no need to exist, and finally we are interested. So how do we plan to do this? And this is really where we need your support and help. To begin with, we plan to organise a day’s retreat with architects selected through many conversations, who we believe will fulfill the following criterion in part or in full. a. Have a body of work, that is the product of critical thought and a decent respectable body. b. Through their writing or research, allowed clear thinking about Architecture in India. c. Are not biased and have a 20-20 vision of India, its economics, culture, and diversity. d. Are positive, not shrivelled, and willing to communicate and share ideas. This retreat will form the ground work for the making the framework of investigation and will also hopefully throw up some clear directions. Based on this, we will work on the SPADE volume, and we do realize that whilst doing so it, may find many ways of coming together – guest editors for parts, projects under review, more discussions that will be reported. But whatever may be the process, we are hoping that at the end, we have a volume that is shorn of soppy emotionalism and fawning noises which will tell it like it is and in doing so hope to position all of us a bit better. We do know its a mammoth foolhardy endeavor but so was 12 on 12 and SPADE and we are game for it. Are you? Will you help? Will you contribute? Will you be happy to discuss? Warm regards and hope you have a great festive season. Or leave your comments here.